One young lady is hoping for a repeat of the results she was able to achieve in 2009 in Indianapolis at last year's National FFA Convention. in 2009, Rashele Blakely of Oolagah was the National Proficiency Award Winner in the Diversified Livestock- Entrepreneurship Contest. In 2010, she returns this week to Indianapolis, looking to win another National Title- this time in the Beef Production- Entrepreneurship Category. 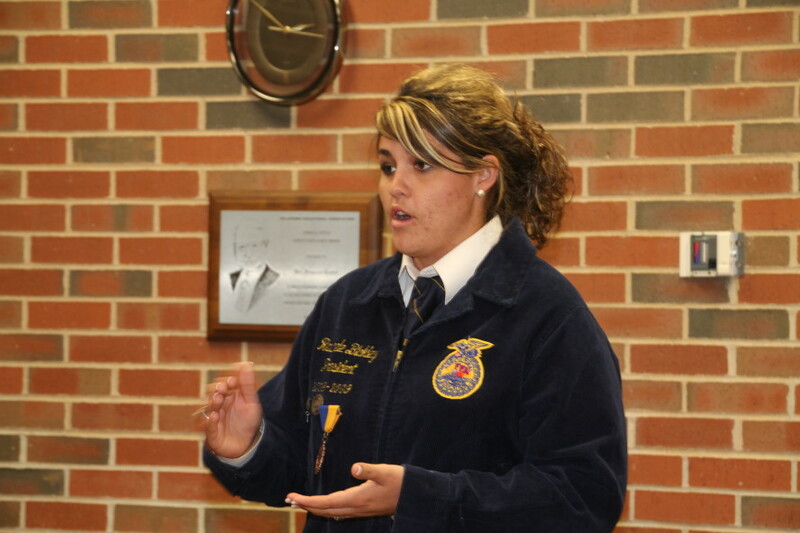 Only one other Oklahoma FFA representative has a similar opportunity- as Kassandra Pfeiffer won in the Beef Production- Placement category in 2009- she is headed back to Indianapolis in the Diversified Livestock- Placement Competition. At the preparatory workouts for National Finalists headed to the 2010 National Convention from Oklahoma this past week- we caught up with Rashele before she worked out before a set of "judges" who then coached her on how to best present her program to the real judges this coming Thursday in Indy. Click on the LISTEN BAR below to learn a little more about her beef operation and how she is vertically integrated as she raises the beef, then sells much of it to consumers in Green Country.